CPI provides thermal and catalytic oxidizer solutions for use in the ceramics manufacturing industry. Technical ceramics are a class of materials known for their engineered properties including strength, purity, fracture toughness, thermal expansion, and heat resistance. The manufacturing of technical ceramic materials involves a firing process typically through a kiln which provides excellent temperature uniformity, precise control, and maximum energy efficiency. During the drying and firing of the ceramics in the kiln Volatile Organic Compounds (VOCs) are released which may require air pollution control. One example of technical ceramics is the monolithic catalyst supports that are the core of most catalytic converters used in automotive vehicle emission control. They are also used in stationary emission control devices, as well as other kinds of reactors in the chemical industry. During an extrusion process, raw materials such as synthetic cordierite, alumina, talc, clay (kaolinite) and silica are reduced to powder and blended into a water-based paste. Additives which may be added in the process include lubricants (e.g. ethylene glycol), bonding agents (e.g. methylcellulose), and fluxes (alkaline hydroxides). Extrusions made from the paste are dried, cut to length, and calcined at temperatures above 1400°C. Organic compounds result from the decomposition and/or incomplete combustion of the binder and other volatile organics in the green product. The flue gases from the drying and firing of the ceramics in the kiln contain Volatile Organic Compounds (VOCs). 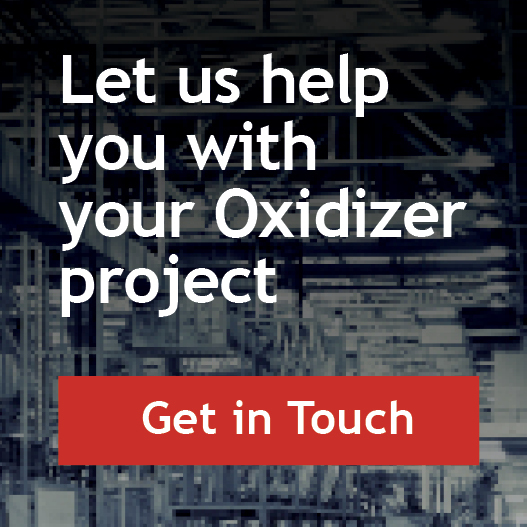 Both Thermal Oxidizers and Catalytic Oxidizers are the most widely accepted control technologies available to control VOC emissions from the ceramics manufacturing process. 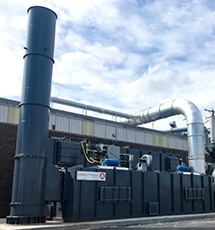 Catalytic Products has installed multiple QUADRANT Series Thermal Recuperative Oxidizers at East Coast USA locations of a global manufacturer of ceramic catalyst substrate for the abatement of Volatile Organic Compounds (VOCs). Thermal (recuperative) Oxidation was selected in these applications based on the customer’s desire to obtain 99.5% VOC and 99% CO destruction efficiencies from their tunnel kiln exhaust while providing a system that offers the highest ability to remove oxygen from the exhaust stream and provide heat recovery back to the kiln with less than 2% O2. The only system capable of providing this high VOC removal efficiency, while meeting the oxygen removal needs necessary for the process is the QUADRANT Series Thermal (recuperative) Oxidizer. Other comparable technologies such as Regenerative Thermal Oxidation or Catalytic Oxidation simply cannot provide the high clean up rates or oxygen removal. 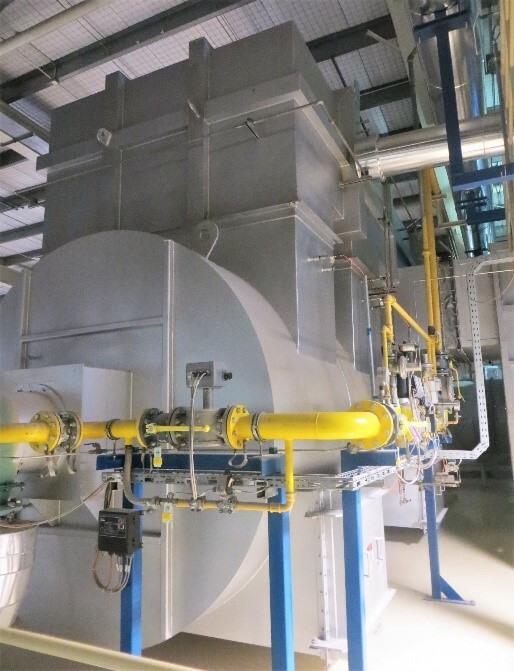 The QUADRANT SR Thermal Oxidizers installed were designed for maximum volumes ranging from 10,000 SCFM to 13,000 SCFM. 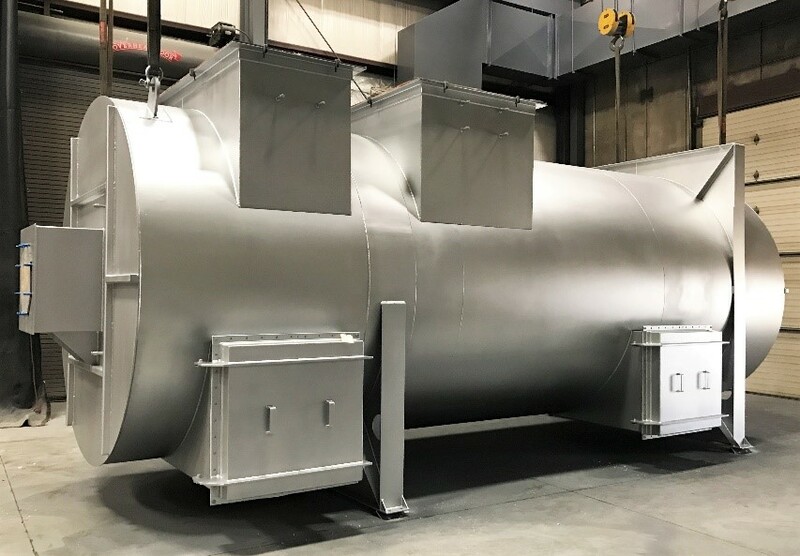 The Thermal Oxidizers utilize superior combustion and dwell chambers coupled with a cylindrical design for efficient destruction of VOCs. The unique design starts by drawing the solvent laden fumes from the tunnel kilns into the high temperature primary heat exchanger where they are preheated to more than 1050 F. From there the process flow enters the high velocity combustion chamber where it then travels down the elongated combustion chamber at very high velocities, causing flame impingement and turbulence to occur and providing excellent mixing of the air stream. In the combustion chamber a combination of natural gas and VOCs in the process stream maintain the temperature profile at 1450 F. Next, the heated process stream enters the dwell chamber where the VOC and CO are converted to harmless CO2 and H20. 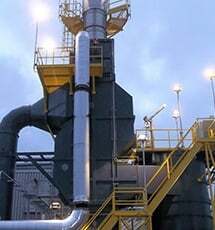 The Quadrant Series Thermal Oxidizer also utilizes both a floating tube primary heat exchanger which was specially designed to work in this high temperature kiln application and a secondary heat exchanger used only as an oxidizer exhaust gas cooling exchanger for use as heat recovery in the kiln.